Greece, officially the Hellenic Republic, is a country in southeastern Europe, situated on the southern end of the Balkan Peninsula. The country has borders with Albania, the Republic of Macedonia and Bulgaria to the north, and Turkey to the east. The Aegean Sea lies to the east and south of mainland Greece, while the Ionian Sea lies to the west. Both parts of the Eastern Mediterranean basin feature a vast number of islands, islets and rock islands. Rhodes is a Greek island approximately 18 kilometres southwest of Turkey in eastern Aegean Sea. It is the largest of the Dodecanese islands in terms of both land area and population, with a population of 117,007 of which 53,709 resided in the homonymous capital city of the island. Prasonisi is a beautiful spot in Rhodes. The sea is split in two parts. This creates a flat (offshore winds) and a wave spot (onshore) at the same time. The best months to go to Rhodes are the summer months June to August. There is a big variaty for accommodation on Rhodes. Rhodes Hotels are scattered all around this very touristy and popular island. The more luxurious hotels are located in the capital, the main villages and towns and in all the resorts of Rhodes. Other kind of accommodations can also be found in cosmopolitan Rhodes. The climate of Rhodes is a mild Mediterranean climate characterised by sunny and dry summers and mild winters. Refreshing breezes and winds are blowing during the months of July and August, making the temperatures more bearable. In the summer the avarage temperature is 30°C. 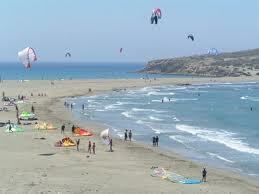 The beach in Prasonisi is a big sandy beach, around 500meters. Cars are allowed so in summer it can be crowded by bystanders and cars. With strong winds and high tide the water can get very high. 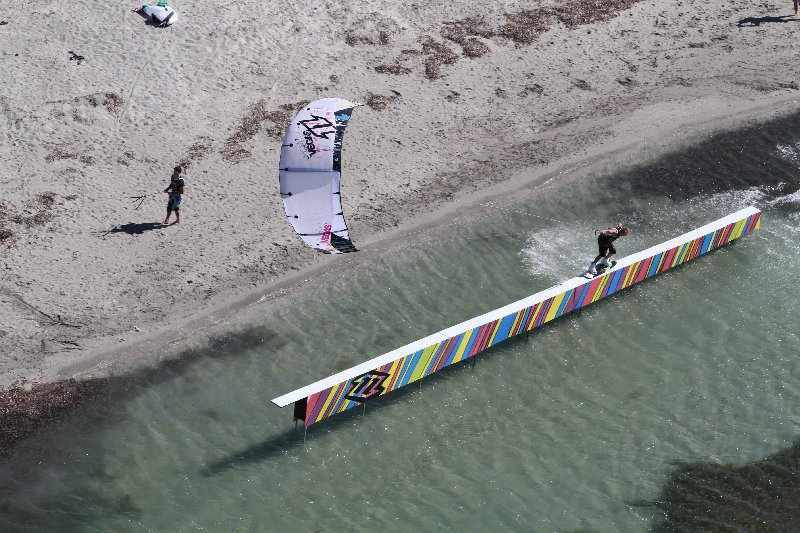 The offshore area are mostly used by windsurfers. The Meltemi wind on Rhodes is thermal. The wind on Prasonisi gets stronger because of the two mountains at the ends of the beach. The Meltemi blows from the northwest from June to August and is onshore and offshore. The wind begins easy in the morning and gets stronger in the midday. In other months the Tramontana can blow. You can use all facilities on this spot. There are a couple of restaurants and a mini shop. The nearest airport is Rhodes. The nearest town is Prasonisi. You can also take the ferry from Athens/Pireaus. 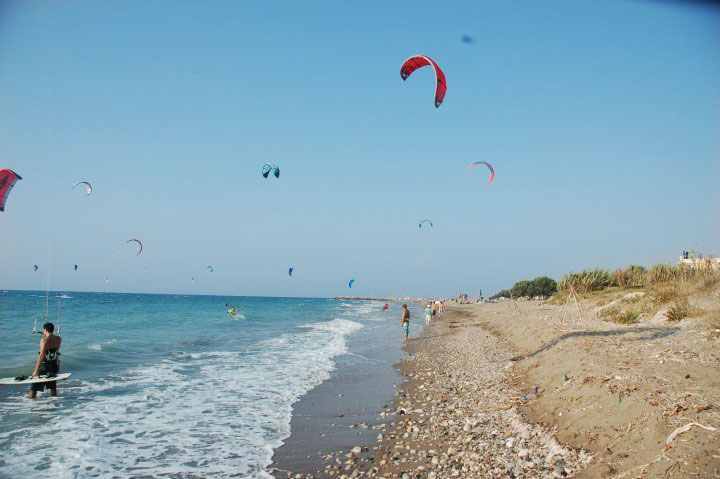 The sandy beach is medium sized (600meters). The beach is not crowded. Watch out for some stones/shells/trees/cars on the beach. The water is crystal clear and has a temperature of 24Â°C in the summer months. So you don't need a wetsuit in these warm months. The water is flat to choppy, only with stronger winds there are small waves. The thermal wind (Meltemi) blowns mainly from the west and is sideshore with 4-6 Bft. The best months are June-September. There are toilets and showers. There is a parking and you can get food on the spot. Link exchange is nothing else except it is just placing the other person's weblog link on your page at proper place and other person will also do similar in favor of you.